Our Residential Division has taken a lead in providing residential construction services, focusing primarily on Tenant Fit Outs, Residential Remodels, and Modular Home Construction beginning in 1999. This modular home is typical of the type of modular construction that Belt Built performs. Modular homes are sectional prefabricated houses, that consist of multiple sections called modules. The module sections are constructed at an off-site facility, then delivered to the intended site of use where the construction of the prefabricated sections is completed on site as they are joined together to make a single building. 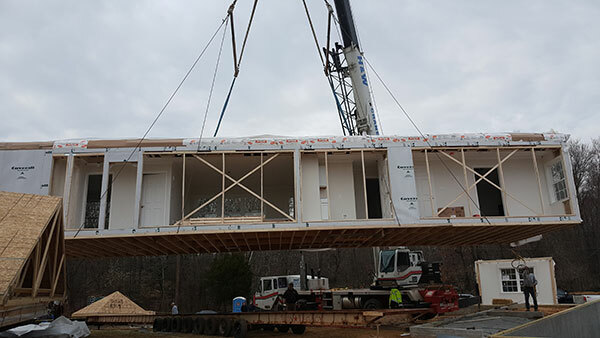 Theses modular homes are built to the same or higher building standards as on-site stick-built homes, conforming to all local building codes for their proposed use. Modular construction allows for the building and the site work to be completed simultaneously because with modular construction, walls, floors, ceilings, and rafters are all built at the same time, and then brought together in the same factory to form a building. This process can allow modular construction times of half that of conventional, stick-built construction. Modular construction also reduces waste and site disturbance compared to site-built structures. Modular homes, once assembled and landscaped, can be virtually indistinguishable from a site-built structure. A substantial portion of this project was New Construction, which included two additions for the mechanical/emergency generator rooms and the day room, complete with raised ridge roofing. The exterior walls for all sections, storefronts and windows were constructed to meet Anti-Terrorism Force Protection Requirements and given an EFIS finish. Special features of this building included the installation of a state of the art Fire Station Control and Monitoring System, LEED Silver Certifiable Construction, Green Globes US Compliant, and R-60 Building Envelope. Construction of Building 17 provided complete Fire Service Quarters for the Distribution Depot Tobyhanna and the Defense Logistics Agency (DLA). The balance of the project consisted of demolition down to the structural steel, modification of site utilities. New features were added to meet current government standards, including new gypsum walls/ceilings, suspended acoustic tile ceilings, all new restrooms with showers, electrical distribution, HVAC systems, boilers, plumbing systems, new bunkrooms, kitchen, fire alarm/mass notification system, fire suppression, and EPDM roofing. This Design/Bid/Build Project entailed the demo of old and the re-fit of the new – Wrestling Locker Rooms and Shower Facilities at US Naval Academy. This project included demolition, framing and drywall, ceilings, specialized flooring, extensive tile work, countertops, plumbing and electrical, as well as an HVAC upgrade to include a new air handling Unit. The project was executed on an academic campus, during the school year, with limited laydown and parking areas. The work required constant communication, and careful coordination, to ensure the Midshipmen could continue with their daily activities and have access to all areas of the campus at all times. The locker room schedule was coordinated with NAVFAC and the Naval Academy Athletic Association to minimize impact to the athletes. The work was scheduled to limit interference with the wrestling and swimming seasons. All utility shutdowns and hot work were scheduled in advance. All personnel were cleared for work on the Naval Academy grounds. The number of contractor vehicles with access to the site was limited, requiring coordination of crews and material. All deliveries were scheduled in advance and screened at security.